Neil Broadfoot’s breakneck debut, Falling Fast, introduced Edinburgh investigative journalist Doug McGregor and his police contact, DS Susie Drummond. 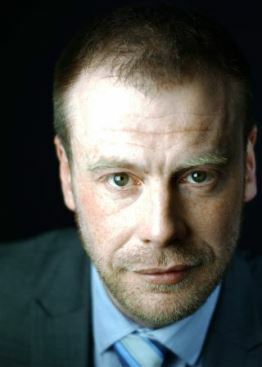 Widely praised by critics, crime fiction authors and readers alike, it was shortlisted for both the Dundee International Prize and the prestigious Deanston Scottish Crime Book of the Year Award, immediately establishing him as a fixture on the Tartan Noir scene. Your previous three books were set in Edinburgh, why the move to Stirling? Like most of my writing, it was completely random. I was happily working away on the next Doug and Susie book set in Edinburgh, when I went to the Bloody Scotland crime festival in Stirling. As you know, one of the mainstays of the weekend is the Scotland v England crime writers football match that takes place at the bowling green at Cowane’s Hospital at the top of the town. I was sitting watching the match and suddenly, as happens, the thought occurred to me that this would be a great place to dump a body. You had a reporter as a central character in the previous novels and you have another in No Man’s Land. Does your own previous career as a journalist lead you down this path, or are they a way of opening out an investigation and story that might not be possible by keeping to Police procedure? As I never plan or plot anything, it’s probably my way of making sense of what the story is trying to tell me. You’re right, I spent 15 years as a journalist, and that taught me how to approach stories in very specific ways, how to research, the questions to ask. With a murder like the first one in No Man’s Land, it would only be natural that there would be a lot of headlines and reporters jostling for coverage. Which got me thinking, what if there was one reporter who was jostling harder than others, who was more motivated to get the exclusive? And from there, Donna Blake was born. You make fine use of the open and hidden sectarianism in Scotland, but how prevalent is that within the current political landscape of Scotland? Sectarianism is, unfortunately, something that’s been in Scotland for centuries, it’s almost part of the landscape, particularly in some sections of our sporting life. In politics, it’s a different kind of division, not along religious lines but ideological ones. And in Scotland, the big one at the moment, being fuelled by Brexit and the catastrophe at Westminster, is independence. Like most things, the debate is on a spectrum, which swings from considered and measured to positively evangelical. It’s understandable given the stakes, but it can make the debate ugly. Unfortunately, with the way things are going, I don’t see it being resolved any time soon. 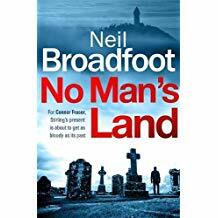 Your central character in No Man’s Land, Connor Fraser, is a former Police Service of Northern Ireland (PSNI) officer, now working in close security. Why him? When I got the intro to No Man’s Land, it became apparent very quickly that the protagonist was going to be dealing with some nasty people and extreme violence. So I needed someone who could handle himself, someone who was trained, was familiar with firearms and would act decisively. The training that officers with the PSNI go through matched what I wanted for Connor, and I love Belfast, it’s a city I’ve spent a lot of time in. I always wanted to write about Belfast, so this gave me the opportunity to do that. You have a wife, two young children and three dogs, so must have a busy and sometimes noisy household. How do you structure your writing day to have some sort of work/life balance? I mostly write at night, but squeeze in what I can, when I can around that. Luckily enough, my wife was a journalist as well, so she understands when I say I’m on a deadline and disappear for hours on end. I joke that writing is work that never feels like a job, but at the end of the day it is just that, a job. You’ve got to have the discipline to keep going back to the work. Luckily, that gets easier for me the further I get into a book and the more lost I get in the story, as I want to know what’s happening as badly as the reader! You’ve spoken about A Study in Scarlet and McIlvanney’s ‘Laidlaw’ books as being touchstones and also been fulsome in your praise of a number of modern day Scottish writers. Are there any Welsh, Irish or English crime writers that you get excited about when you hear they have a new book on the way? God yes. One of the great thing about crime writing at the moment is that there are so many great writers out there producing outstanding work. For my sins, I’m not too familiar with Welsh writers, but anything from Irish writers such as Stuart Neville (The Twelve just blew me away), Adrian McKinty (the Duffy series) or Steve Cavanagh (who wrote it out of the park with Thirteen and Twisted) always goes to the top of my TBR pile. From England, Alex North is going to set the world on fire with The Whisper Man, Tony Kent is set for stardom, Derek Farrell’s Danny Bird series is an utter delight that brims with heart and Mark Billingham can, in my view, do no wrong. Oh, and going back to Scotland for a second, Douglas Skelton’s Thunder Bay is going to be a busy book come awards season, and Helen Fields’ Perfect Crime is practically perfect…. Whilst you been writing with a male central protagonist, there is always a strong and involving female character within your books. You obviously feel that having that element within your stories is essential and do you enjoy writing from a female perspective? The funny thing is that I don’t see myself as writing from a female perspective, I’m writing a character that happens to be a woman. I think it’s important that all characters are fully rounded and believable people, each with their own struggles. One thing I hate in crime fiction, and in TV or films as well, is when a female character is only seen as a plot device rather than a person. For example, the scantily clad body that’s found draped across the grave who the strong male hero vows to get justice for. It’s cheap and demeaning, so I’m always conscious that every character, male or female, has to be properly fleshed out. Returning to journalism, did your previous career nudge you in the direction of the political shenanigans in No Man’s Land, or was it an opportunity to shine a light on something well known, but seldom talked or written about. I think it was more that I was reacting to everything that’s going on in the news and current affairs right now. Stuart MacBride once said that, if you want to get a sense of what’s going on in the world in a specific time, read the crime fiction from that time, and I think that’s right. Writing contemporary fiction you’ve got to reflect the world we’re living in, and the world we’re living in at the moment is utterly insane. As a journalist who spent a lot of time covering politics, it fascinates and terrifies me in equal measure. So yeah, there were questions I wanted to ask and attitudes I wanted to expose, and these found their way into the book. Last question. You have a dinner party for yourself and five other authors, dead or alive. Who would the five be and why? You don’t like to make it easy for a writer, do you? Tough question. I’d love to sit down with Conan Doyle and meet the man behind the myth. Same with Stephen King, he’s been a hero of mine for as long as I can remember and his work inspired my early dabblings with horror. Helen Fields would have to be there as my drinking companion for the night (that woman is lethal with Jameson and gets me into all sorts of trouble), Craig Russell would be a must (I’ve had dinner with Craig and the man can cook!) Lastly, I’d have to invite Mick Herron along- the Jackson Lamb series is just sublime, and I’d love to talk about that with him – hopefully with better table manners on show than those displayed by Jackson!